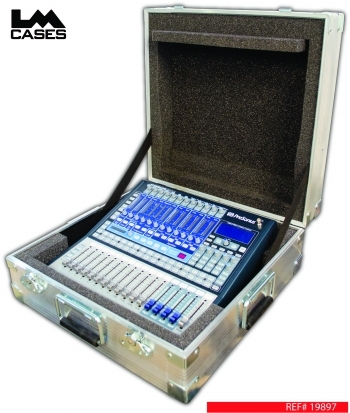 This case is designed for the Presonus 16.0.2. mixing console. The case is part of our XL Series line of cases, these cases feature a custom aluminum extrusion wrapped around a 1/4″ piece of plywood. The aluminum extrusion utilizes an interlocking tongue and groove to allow for strong lid and base alignment. 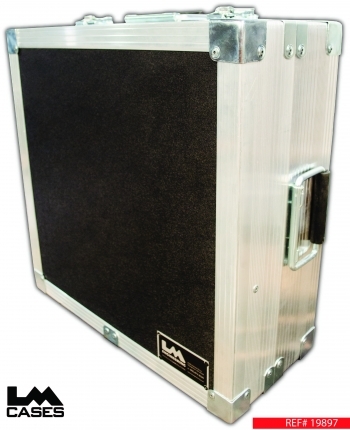 The aluminum and plywood panel combination results in a strong, lightweight and inexpensive case. The mixer is surrounded by 1″ foam and has a 2″ deep accessory compartment below the mixer. The exterior case is equipped with 2 surface mounted twist latches and 3 surface mounted spring loaded handles. Any of our standard colors are available at no additional charge.